The day will come when Spare Time Machine is revered as the masterpiece it is by the crowd it deserves. Luckily, Tomi Paajaanen and James Spectrum have this happy pill to keep them sane until that day arrives. "What music can possibly withstand, after the passage of years, the taint of out-of-dateness imparted by the cadences and embroidery which made it popular when new?" If the sentiment of Eugène Delacroix holds any weight -- and the use of his art for the cover of Coldplay's 2008 album Viva La Vida or Death and All His Friends indicates he still has a place in popular culture -- perceptions have changed since the mid-1800s. In the early 1900s, modernism expressed the notion that taking something older and making it new could create stronger art than that shot from the hip of narrow personal experience. Since that time, many if not most of modern culture's most celebrated works contain obvious elements of past work. Poetry and novels constantly reimagine fables and well-known mythology in radically different settings; visual art coasted from realism to surrealism, Dadaism and pop, and movies remake books and older films. In music, symphonies continue to fill their programs with pieces over a hundred years old. Hip-hop wouldn't exist were it not for the sampling of existing records, and the popularity of every sub-genre in rock history has been visited, revolted against, and revisited several times over. Finland's Pepe Deluxé exemplifies the epitome of old meets new; the mission of their sound goes way beyond reactionary trends and trivial nostalgia. Pepe Deluxé is the hard work of Tomi "JA-Jazz" Paajaanen and James Spectrum. Their third album of bizarre psychedelia, reconstructed from sampled sounds with a hip-hop attitude, debuted in 2007, and is still making waves. 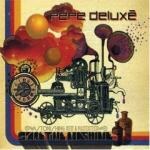 In their self-imposed “quest” for the lapis philosophorum (philosopher's stone) of sound, Pepe Deluxé concluded that recorded music was closest to perfection in the late 1960s and early '70s. As such, their 2007 opus Spare Time Machine was spiritually and sonically born of that age. As recording technology and production has advanced over time, the listener's awareness of the musical embroidery that dates works has never been higher. To a trained ear, it is generally easy to distinguish audio recordings made in 2009, 1989, 1969, and 1949 unless deliberate and remarkable steps have been taken to obscure their age. Many artists have reasons for doing just that as, over time, the embroidery that dates certain works can become what makes it most appealing. I'm sure Quentin Tarantino, Bibio, and the White Stripes would agree with that sentiment. Likewise, James Spectrum of Pepe Deluxé has noted that, with old albums, you don't just hear the band playing; you hear the signature sound of engineers and studios, often with their own custom-made equipment, such as a self-designed echo chamber. For Spectrum, when thinking about the recording aspect of music, the color added is most essential. Pepe Deluxé's website provides more evidence of their "quest", often featuring surrealist "documentation" to legitimize their goal. A letter of recommendation from Ultratone Electrosonic Industries, a fantasy magic bag institute, describes Paajaanen and Spectrum's obsession with discovering the philosopher's stone, also referred to as the Aural Grand Unified Theory of All (technically, it's imaginary too, unless you believe in it enough). The letter went on to say, "The remaining evidence points to the fact that during the late '60s several brave sonic investigators got very close to reaching this goal [of discovery]." As of the writing of this article, Spare Time Machine was Pepe Deluxé's closest attempt in achieving this quest. Their first album, 1999's Super Sound was deeply informed by founding member and turntablist, DJ Slow, who left the group shortly after its release. The hip-hop based (super) sound, bubbling with flashes of camp lounge and classic funk, was constructed almost entirely from samples dug from dusty record bins at garage sales and flea markets, so much so that three separate versions of it had to be created to ensure its legal release in some countries. With DJ Slow largely out of the picture, their second album, 2003's lauded Beatitude, relied less on samples and hip-hop structure but injected more obvious innuendos to vintage recordings and a timeless visual aesthetic, from its dense cover art to the aural homage throughout the disc. The cover of Beatitude featured two cane wielding, turn-of-the-century gentlemen in fine hats standing next to Marshall-brand amplifiers in a field. The liner notes were full of nods to Dadaist collage, forgotten pseudo-scientific theories, expressionism, and references to the first astronauts and other sepia-toned memories. Ultratone Electrosonic Industries is referred to again, and credited with contributing several vintage effects and techniques, including genuine Joe Meek "Black Box" reverb (Meek pioneered studio reverb). Rock influences took a more dominant role in the mix, while the funk and campness clarified their positions. Reviews and sales all indicated that the group had improved in all areas over their debut. It took four years for the emergence of their next full-length, but it surfaced to usher in a series of small but important changes. The most notable was that Spare Time Machine contained no outside samples at all. Nothing “old” was used. Instead, Paajaanen and Spectrum spent countless hours in the studio trying to "make things sound like old recordings" and laying them all down on cassette as un-synched samples with the aid of the greater part of the line-up from Catskills Records labelmates Husky Rescue and a few hangers-on. Most notably, Paul Malmström, who had helped out since Beatitude, brought his four vintage Fenders down to the studio. The band's composer, Spectrum, feeds off the spirit of the '60s. He considers it one of the greatest eras of creativity and experimentation, when so many things were tried, invented, and used for the first time. Advancing technology, powerful hallucinogens, and intense political circumstances affected all developed nations, melding with music in different ways to this day. It was like discovering a new continent, where other people come after you and map the whole thing, but you were the first one to step on that beach. In his quest for true, original vintage sounds, Spectrum had set off "on a sort of musical archaeology, tracking down obscure studio gear and Russian electronic components, working on various inventions" between albums. Once they arrived at the right sound, these "samples" then had to be mixed, edited, and arranged to perform the tasks for which they were imagined. The guitar work throughout is a distorted flashback fantasy, with "Mischief of Cloud Six" recalling Roger McGuinn on "Eight Miles High", "Go for Blue" flashing shades of Hendrix, "Last of the Great Explorers" falling into an Eddie Hazel funk, and all of it blasted through brutally shredded amps and gnarly handmade fuzz boxes. The drums are equally insane. "Mischief" alone contains hints of jazz, surf, soul, funk, rock, and Latin. Of course, the final product was painstakingly compiled out of ten different drum tracks and several takes, but the labor of love can be felt. The vocals and lyrics also hit a new high, capturing a unique presence across different vocalists and styles, from a Lee Hazelwood slice of smoky country croon to raving acid guru in an Arthur Brown vein. Yet, something utterly exceptional shines through all the myriad influences, something uniquely Pepe Deluxé that places the album among contemporaries and not in the category of mere derivative followers. It must take intense concentration and patience to keep these songs together. Even though every part of each instrumental is a thousand-piece puzzle, every one sounds like a unified picture. The results are seamless and intricate, making for a record of pure joy that rewards every listen with a new yet familiar experience. There is no doubt it will age well because it already sounds well-aged. The small handful of reviews Spare Time Machine received on its initial release proclaimed it as a successful progression of their skills from the first to the second record, but sales never caught up to the positive critical opinion. According to Spectrum, the album sold one copy in Denmark. Apparently, it received almost as many album-of-the-year awards as it sold copies, culminating with an Emma (the Finnish version of Grammy) in the critic's choice category. The day will come when Spare Time Machine is revered as the masterpiece it is by the crowd it deserves. And some day, the lapis philosophorum of sound will be found. Luckily, Paajaanen and James Spectrum have this happy pill to keep them sane until that day arrives. I think the lyrics of "Go For Blue" sum it all up nicely: "You know, I was walking down the street feelin' kinda low the other day. I was feeling kinda blue, you know what I mean? I was just wishing I could get together with somebody, maybe getting a little brightness goin'. I looked up in the sky and I saw a rainbow, baby. I thought to myself, 'All them colors up there makin' a big, big arch, you know, working together, like.' And I thought, 'what a glorious sight. If them colors can do it, maybe we can too, baby. And everything would be alright.' It's gonna be alright."